PEGGY BAWN is a rare thing indeed. The number of surviving vessels from pioneering Clydeside yacht designer George Lennox Watson’s lifetime (1851-1904) can be counted on a careless carpenter’s fingers. PEGGY BAWN’s gilded “fiddle” bow was anachronistic even at her launching in 1894, partly a past fad, partly practical, undoubtedly beautiful – an interim stage in the development of extending immersed waterlines for faster sailing when heeled with a more buoyant hull – but it conceals the fact that when her award-winning restoration team began assessing what they’d found in a County Waterford hay barn in 2003, they quickly realised that the “numbers” – yacht designer speak for the various ratios that define a hull – were simply a scaled-down version of those for Watson’s famous royal racing cutter Britannia of 1893. Her name gave rise to the so called “Britannia Ideal”, as she was and is considered the epitome of sea kindliness. PEGGY BAWN's present owner can vouch for that from fourteen seasons of racing and cruising aboard her in northern and Mediterranean Europe, and east coast USA. PEGGY BAWN is quite simply the best behaved yacht any of them had had the pleasure to sail. And her rebuild and restoration set new standards for documentation and authenticity. She's special. Designed by G L Watson and built by John Hilditch in Carrickfergus for the Commodore of the Carrickfergus Sailing Club, J. Alfred Lepper, PEGGY BAWN was launched in 1894. Watson was the pre-eminent yacht designer of the period, having designed BRITANNIA for the Prince of Wales in 1893 as well as numerous others. He also personally raced in comparably sized yachts to PEGGY BAWN. The yacht was very little altered and generally lightly used for most of her recent life. 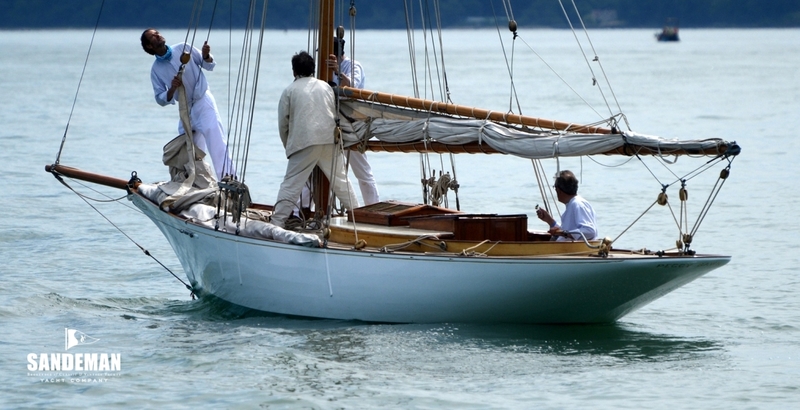 By the end of the 1990s and out of commission an abortive start on her restoration was made. The current owner purchased her in the winter of 2002-03 for complete restoration. 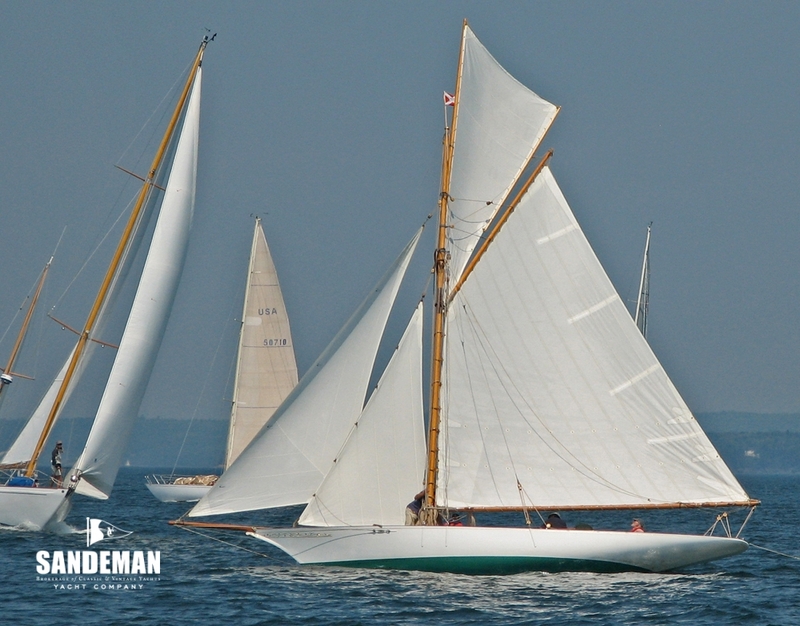 The owner, Hal Sisk, has previously owned and restored several sailing yachts. His project manager, Iain McAllister, is a professional yacht captain and had known of PEGGY BAWN since the early 1980s. The boat builder was Michael Kennedy, a very experienced shipwright who led a small team of other craftsmen. 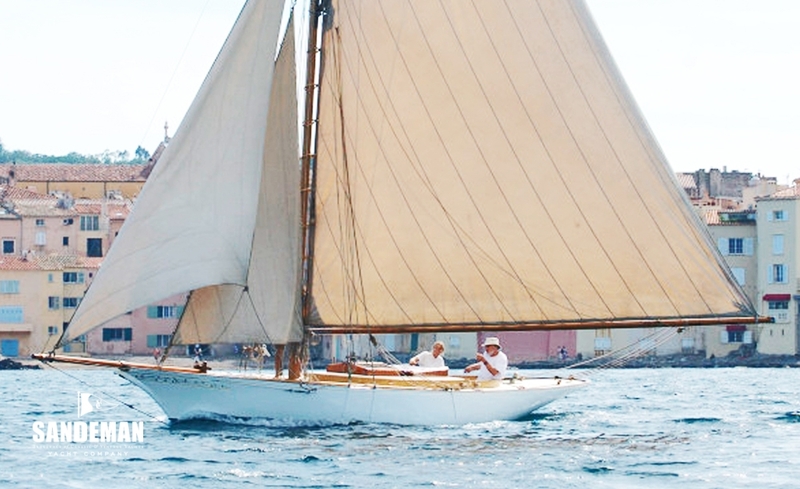 The consultant naval architect was Theodore Rye, who specialises in restoration work of wooden sailing yachts. The marine engineer was Harry Hannon. The restoration / rebuild was over two years, from April 2003, and took place in a modern, roofed and well lit workshop at Rathmoylan, Dunmore East, Co Waterford. 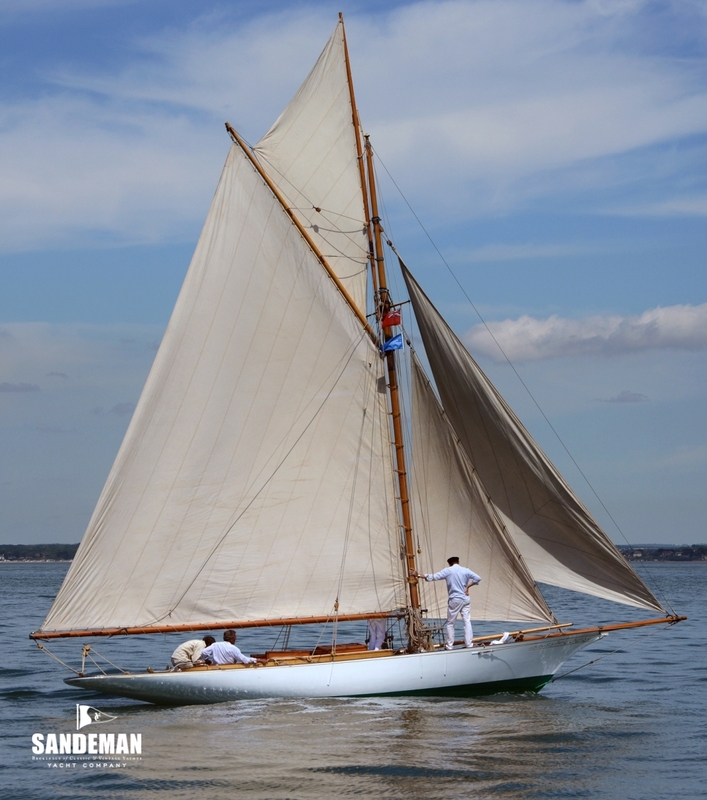 Featured on the front covers of “Classic Boat” and “Wooden Boat”, this exemplary restoration was covered in 9 successive articles in Classic Boat. She was winner “Restoration of the Year” Germany 2006. Today she is competitive under CIM and Baltic Racing Rules. The restoration / rebuild was over two years, starting in April 2003, and took place in a modern, roofed and well lit workshop at Rathmoylan, Dunmore East, Co Waterford. Prior to starting the rebuild, two months were spent recording the dimensions and construction processes of the original and a full size lofting took place, recorded on CAD. In general the original work and the rebuild were done to standards exceeding those of Lloyd’s Register Yacht & Small Craft rules (although there is no evidence the yacht was ever classified). PEGGY BAWN has been completely rebuilt to the extent that she has a completely new hull and deck atop the original lead keel. Certain sound non structural parts of the original were retained and re-used such as the fore hatch, skylight, companionway hatch, cockpit seating, the majority of the interior furniture, the tiller and rudder head and most of the rig. Since restoration she has continued to be professionally maintained. This is a summary of the essential construction elements. Comprehensive details and descriptions of materials used – and in the restoration are available on request. 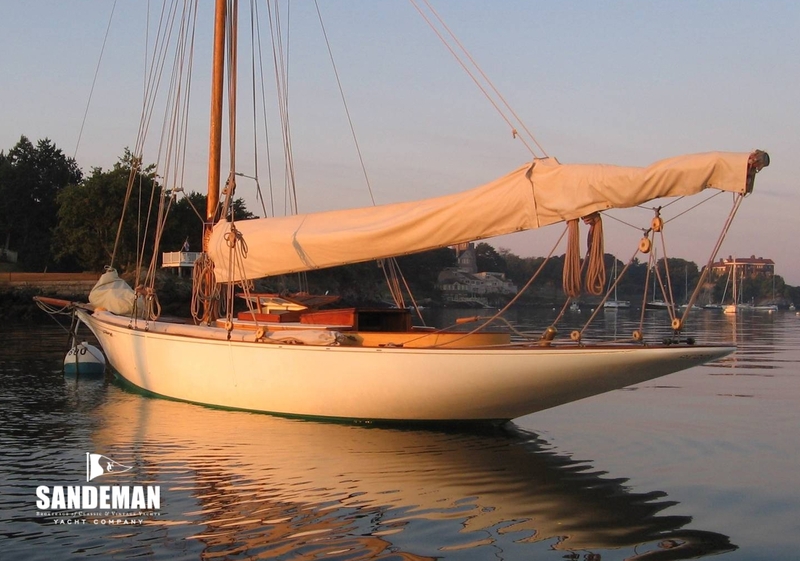 The rig is gaff cutter; the mast, bowsprit, boom and spinnaker pole all well built spars, solid and built up of nice lengths of timber; scraped and refinished. The gaff and topsail yard are new solid spars from Collars Ltd. The retained fittings of galvanised iron or steel include the gooseneck bands, gaff throat straps, mainmast irons and sheave. New galvanised mild steel items include the gooseneck straps and boom clew iron. There is a new bowsprit cranse iron in cast bronze. The bobstay hull fitting is a forged bronze fitting, screwed to the stem, linking to a forged and adjustable bronze bobstay rod. The mast is stepped by a simple tenon and there is a bronze bar deck strut under deck. 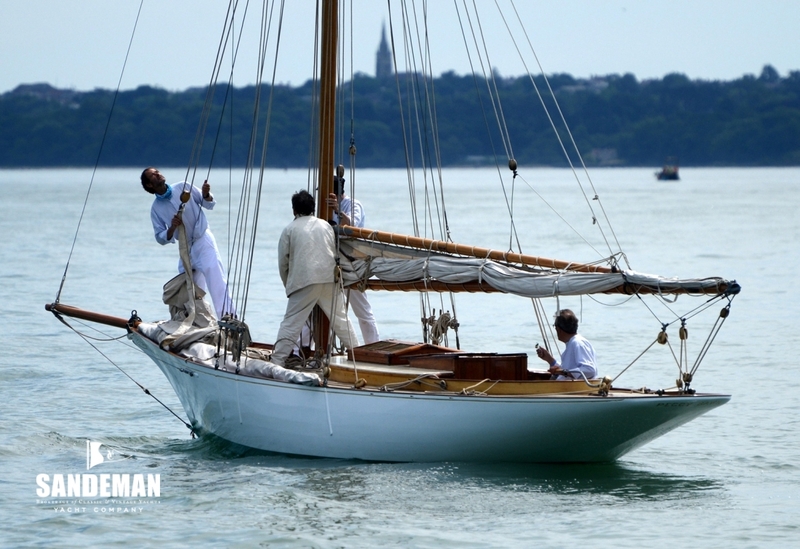 There is provision for a mainsail, staysail, jib, long roper jib, topsail and spinnaker. The staysail is set on a forestay, where the jib is set flying on a traveller to the bowsprit end. The \"long-roper\" jib is a full hoist on the topmast forestay light airs ghosting sail with sheet lead via the leeward mainsheet cleat. - Motor control lever is located in the port cockpit locker. - Battery switch forward in port cockpit locker. This trailer is longer and wider than the boat, thereby protecting her from such shunting. Moreover because loading and unloading only ever happens under personal supervision at a boatyard, instead of a secure port compound with no possibility for access, all means can be taken to reduce the chance of damage. 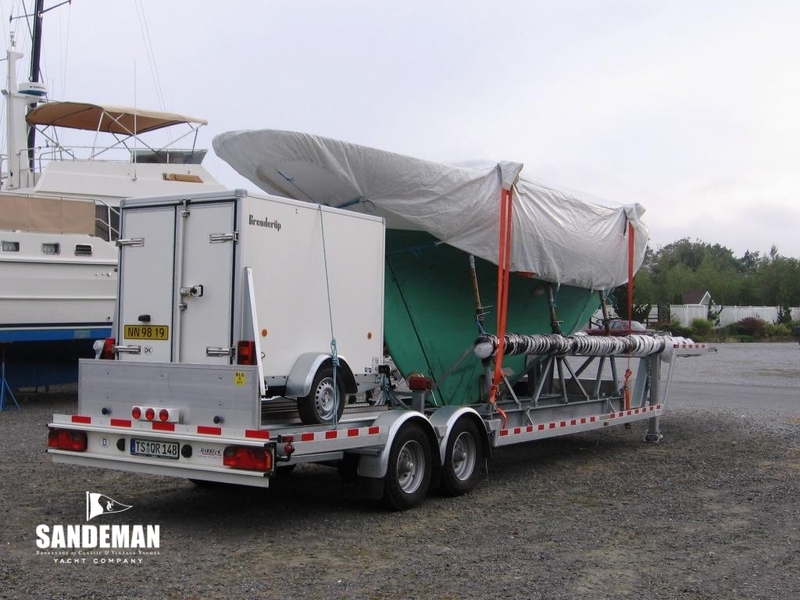 Another advantage of having her own trailer is that the boat can be prepared for haulage in good time, without an impatient trucker hanging around. Typically therefore everything is prepared for uplift days before the haulier is due, allowing, among other things, time for the boat’s minder to get to the next destination in time. A timber tie-down frame is designed so that its four carpeted pads sit on the deck. At four points, tie-down straps lead from the trailer up and round the ends of two athwartships spar parts of this frame and back down to the trailer, meaning that no straps cross the boat, the capping rail is protected and the tie-down is positively vertical at four points. Further straps are then not required at her sensitive overhangs. There is a transport cover made to her lines, with deep sides to protect the topsides from the elements, and the whole vessel from potentially rusty deck-head drips, ship funnel and truck exhaust soot, and general transportation pollution. Since 2007, Peggy Bawn has travelled on her trailer from Denmark to Maine via Bremerhaven and Baltimore; from New York to Denmark via Baltimore and Gothenburg; from Denmark to the Clyde via Esbjerg-Immingham; from Ardfern, west coast of Scotland to Plymouth & Falmouth; from Falmouth to Denmark via Harwich-Esbjerg; from Denmark to Lymington via Esbjerg- Harwich and from Fowey to Denmark via Harwich-Esbjerg – all without even the slightest damage. In winter storage, Peggy Bawn is always sitting on her own substantial cradle – with three keel and six hull supports - which is incorporated into the trailer but removable. The cradle was originally made during the rebuild and is strong enough to be used for craning her from four lifting points, using her own spreader bars if necessary. It also supports her with the waterline level (impossible otherwise because of her “v” profile), allowing drainage of any accumulated water in the non-self-draining cockpit to run off via the bilge sump bung. The centre, longitudinal, keel supporting member is designed to be unbolted from the rest of the cradle to be used in the keel trough of a specialised commercial transport yacht trailer, keeping her level to waterline as above. The trailer is designed for winching up a Brenderup “Cargo” box trailer onto the rear section, under Peggy Bawn’s counter overhang, using a custom ramp system. This shelved box trailer serves as a secure, dry store in transit, especially for her cotton sails. For the return voyage to USA it satisfied the voyage insurers that everything loose and valuable was locked up – because Peggy Bawn does not have a lock at her companionway. There is further information including detailed plans with dimensions and compliance with various national road etc regulations available on request.